Lecturar at KMC Manipal : 2Yrs. 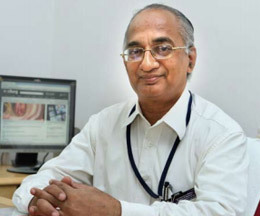 Since 1988 working in PSG IMS& R and presently Head of the Department of General& GI Surgery. Participated in many Clinical trials conducted in the hospital with ethical approval. Developed the Department to present Status from the beginning. Various cases studied and performed as well as published in medical Journal mainly on oesophagus, pancreas and thyroid. Performing all types of Major GI surgical procedure and Oncological Procedure in PSG Hospital. Involved in curriculum planning for UG and PG Programme in Our Hospital.